Earlier this week we shared a pretty gallery of details for the final (confirmed) DLC pack for Hyrule Warriors Legends and the original Hyrule Warriors. 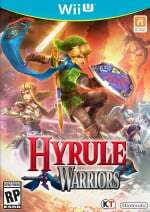 It's based on The Legend of Zelda: A Link Between Worlds, and adds both Ravio and Yuga as playable characters; in the 3DS game it also includes a new Adventure Mode map, extra challenges, My Fairy costumes and some rather handsome outfits. In any case, those details and images were from the official Japanese website, but now a new trailer confirms that the pack will also be arriving in the West on 31st October - check it out below. It'll be included with the Season Pass, will cost $6.99 / £6.29 / €6.99 separately on 3DS, and $4.99 / £4.49 / €4.99 on Wii U. Remember that in the Wii U original you only get the two playable characters, not the extra goodies. Are you planning to pick up this DLC? I haven't picked up any of the Legends DLC characters on the Wii U version. I probably won't get this. I think I'm pretty much done with that game. I am getting it; this game has a ton of content and is well worth the money. Awww HELL YEAH! More adventure mode maps I'll never complete! Ravio looks like a jack of all trades,since he can use multiple weapons instead of just one. ...I'll just wait for an actual new sequel to this game instead. This may as well be a 3DS story. The Wii U DLC effort is so lazy by comparison. I bought the first Season pass and I bought the character pack DLC but I don't think I'll buy the remaining DLC as a form of protest or unless it goes on sale, then I may be tempted. Nice, the amount of content Legends got was insane. I have so many adventure maps I haven't finished yet. I can see Nintendo still developing a switch game that has a n3ds counterpart. Smash, yoshi, maker, this, and I could continue. Why not a sequel to link between worlds that's playable on both consoles? Or many other games. Have to figure out stuff to play for the four days before this drops. Other than some of the adventure missions being super cheap or straight up impossible this has really been a spectacular title. Why do they bother putting out the 3DS footage instead of the pretty HD Wii U footage? @ninjapenguin1 You get more out of the 3DS DLC on a 3DS. The Wii U version only gets you the characters and nothing else. #12 - Because the new content is for the 3DS version. The Wii U version only gets the new charaters to play with. So there would nothing to show people. Guess now they can either get to work on a Switch port with even more obscure character choices or a sequel. Though if we get a sequel, I hope its based off Kid Icarus (Skyworld Warriors anyone?). Sigh.. I've avoided this for TWO YEARS now, but there's just so much content that I am looking into it. If they do port this to the Switch, I'll bet they'll throw in all of the DLC without charging any extra. Awesome, wish they would add Villains like Aghanim and Vaati. @dizzy_boy If they do, i'll buy it for a 3rd time. I have both versions but I always go back to playing the Wii U version instead. It's the superior graphically and with co-op it's much more fun. I wish it got the adventure maps and new alternate color costumes too. It's stupid that they don't release at least that now that the 3DS run will be complete. I don't care about my fairy stuff either. I think its finally time for me to get this (3DS) game. There is only two first party games missing in my collection: this and the latest style savvy game. Talk of a potential future playable Ravio was legitimately why I bought it in the first place. This is wonderful.